A recently published analysis by Thomas L. Hungerford (see highlights below) looks at factors driving the growth of income inequality for the period between 1991 to 2006. Hungerford looked at the contributing impact of three factors, tax policy, labor wages and capital income. During the studied period he found that capital income (capital gains, interest income, business income and dividends) was by far the largest factor contributing to rising income inequality. Wages and salaries alone were not a factor and tax policies were only a minor contributor during this period, largely due to the more favorable tax treatment of capital gains. This report doesn’t trace the history of income inequality prior to 1991 where changes in wage growth in the late 1970’s and the collapsing of upper income tax brackets in 1980 and 1985 were more dramatic. It is worth remembering that for most of the past 100 years capital gains was treated as ordinary income for tax purposes. In recent times, capital gains have be treated as a separate class of income with a more favorable tax treatment. Capital ownership has always been more concentrated at the upper end of the income/wealth continuum. Capital is, of course, an ownership stake in our economy whether through stocks, bonds, property or business ownership. The income generated when these capital investments are bought and sold is currently taxed at 15% (if it is held for more than a year). That is less than half the top tax rate for wages and salaries. And how is capital ownership distributed in America? The distribution of wealth ownership, as opposed to income inequality, is even more skewed towards the wealthy as the pie chart below shows. The whole pie represents the total wealth in America. 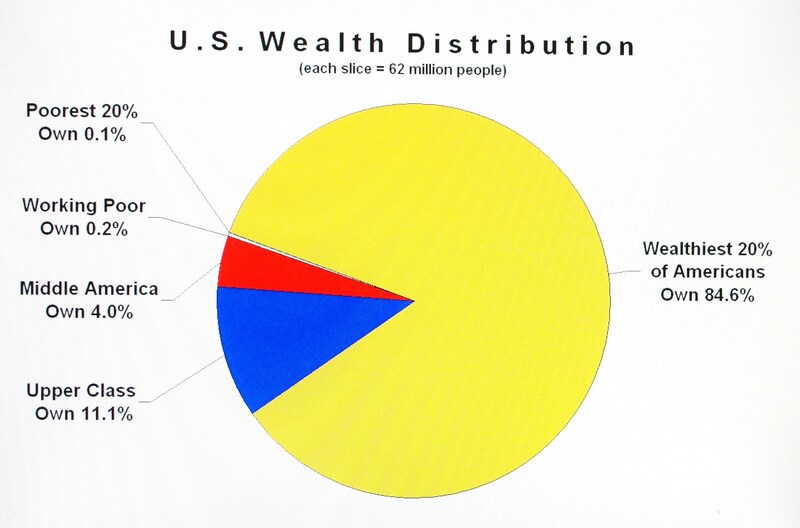 Each of the five slices of the pie represent 20% of the US population according to how much wealth they own. The slice of ownership for the poor and working poor are barely visible. Eighty-percent of all Americans own just 15.6% of America’s wealth. The number of people who slipped into poverty in 2010 was at an all time high of 46.2 million, so the poorest 20% of all Americans, in terms of wealth ownership, includes 15.5 million who are technically above the income poverty line. The poorest 40% of Americans essentially own almost nothing while the top 20% own almost 85% of everything. As a result, favorable tax policies for capital gains income has a highly disproportional benefit for the wealthiest Americans. Capital income for this wealthy segment is what drives rising income inequality today. Research has demonstrated that large income and class disparities adversely affect health and economic well-being (see, for example, Marmot 2004, Wilkinson 1996, Frank 2007, Singh and Siahpush 2006). Research has shown, however, that income mobility [in the United States] is not very great and the degree of income mobility has either remained unchanged or decreased since the 1970’s (Hungerford 2011, and Bradbury 2011). Earnings inequality has been increasing since at least the late-1960s (Kopczuk, Saez, and Song 2010). [The] CBO (2011) has documented that income inequality has been increasing in the United States over the past 35 years. Three potential causes of the increase in after-tax income inequality between 1991 and 2006 are examined in the analysis: changes in labor income (wages and salaries), changes in capital income (interest income, capital gains, dividends, and business income), and changes in taxes. Increased salaries paid to CEOs, managers, financial professionals, and athletes, is estimated to account for 70 percent of the increase in the share of income going to the richest Americans (Bakija, Cole, and Heim 2010). A declining real minimum wage could affect lower income tax filers (the inflation-adjusted minimum wage fell from $6.57 per hour in 1996 to $5.57 per hour in 2006). Income of the richest 0.1 percent of taxpayers is sensitive to changes in asset prices and this may have been especially important in the increase in the income share of those at the top of the income distribution (Bakija, Cole, and Heim 2010). Frabdorf, Grabker, and Schwarze (2011) also find that capital income’s share in disposable income has increased in recent years in the U.S. and show that capital income made a large contribution to income inequality in relation to its share in income. While the individual income tax system is progressive and has been since it was introduced in 1913, the trend has been toward lower marginal tax rates and a less progressive tax system (Piketty and Saez 2007, and Alm, Lee, and Wallace 2005). As a result, the tax system may be less able to equalize after-tax incomes. long-term capital gains tax rate was reduced to 20 percent. By 2006, long-term capital gains and qualified dividends were taxed at 15 percent (5 percent for lower-income taxpayers). Tax policy changes that affect progressivity will affect after-tax income inequality (Kim and Lambert 2009, and Hungerford 2010). Hungerford (2010) notes, however, that about 75 percent of families contain just one tax unit (another 17 percent contain two tax units with the second tax unit usually a cohabitating adult or a working child that cannot be claimed asa dependent on another tax return). Consequently, most of the tax units likely represent a family. capitals gains have increasingly become an important source of compensation for corporate executives (through stock options), and private equity and hedge fund managers (carried interests). Consequently, income from capital gains is included in the analysis. Federal individual and corporate income taxes had an equalizing effect on inequality regardless of the inequality measure. Federal taxes had a slightly greater equalizing effect in 2006 than in 1991—taxes appear to have been slightly more progressive in 2006 than in 1991. The top marginal tax rate in 1991 was 31 percent compared to 35 percent in 2006; the lowest tax marginal rate was 15 percent in 1991 and 10 percent in 2006. However, the increased equalizing effect of the individual income tax is likely due to bracket creep—more income is taxed at the highest rates—than to tax law changes. Tax policy changes appear to have played a direct role: OBRA93 tended to have an equalizing effect on after-tax income while the 2001 and 2003 Bush tax cuts tended to have a disequalizing effect. Tax policy may have also have had an indirect effect on rising income inequality, especially between 2001 and 2006. The reduction in the tax rate on long-term capital gains and qualified dividends may have led to the increased importance of this source in after-tax income. Overall, changes in [wage] labor income does not appear to be a significant source of increased income inequality between 1991 and 2006. Wages had no or a small disequalizing effect when other inequality measures are used. By far, the largest contributor to increasing income inequality (regardless of income inequality measure) was changes in income from capital gains and dividends. Capital gains and dividends were less equally distributed in 1991 than in 2006, though highly unequally distributed in both years. Thomas L. Hungerford currently works at the Congressional Research Service (CRS) which is part of the Library of Congress. The CRS provides the policy and legal analysis to Congressional committees and Members, regardless of their party affiliation. CRS staffers sometimes do reports on their own. Hungerford says this report, “… [does] not reflect the views of the Congressional Research Service or the Library of Congress.” Hungerford is well-published in the professional literature. He has worked for the Social Security Administration, the Office of Management and Budget, and the General Accounting Office in the past. The excerpts highlighted here are of my own. You are encouraged to read the full study at the URL address provide above. Raising Wages Would Revive Our Economy. It seems so obvious that consumption is the fire that powers an economy and money is the fuel. It doesn’t matter from where the spending comes in the short run, but it must come from ordinary people in the long run. Wages paid are dollars spent and a dollar spent is a dollar earned in a free economy. Just as you can dampen consumption by raising the cost of borrowing, you can also dampen consumption by suppressing wages, which is exactly what we have been doing for more than 30 years. Corporations have become cash rich but customer poor. They could end this sluggish economy tomorrow by raising wages. Here are the facts: The federal minimum wage = $7.25 /hr. President Obama wants to raise it to $9.00 /hr. The current US Poverty wage = $10.60 /hr. The current living wage rate averages $16 to $23 /hr depending on where you live. The poverty wage rate and living wage rates are based on a 40 hour work week. Profitable companies paying workers, or their out sourced or supply chain workers, less than a living wage are financially benefitting from government aid to the working poor. We need a stable work force to be competitive. We also can’t have people starving to death in the wealthiest nation on Earth. Companies take advantage of this and let state or federal governments step in to help care for their workers. This amounts to a labor discount. Cheap labor! Corporations are padding their profits at taxpayer expense. At least 45% of working households require some form of government subsidy to maintain their financial stability. The cumulative effect of wage suppression over the past 40 years has become a huge taxpayer drain on households making more than the median income. While almost everyone’s wages are suppressed relative to GDP, the ranks of the working poor have grown to almost half of the work force. Business profits that have not been shared with workers over the years has gone instead to the wealtiest 1% of American’s creating the huge income inequality we have today. In effect, profitable corporations and companies are making their higher paid employees subsidize part-time workers and full-time works who make less than a living wage. So the next time you see that cleaning lady at work, remember your employer is expecting you to subsidize her family though income taxes rather than pay her the living wage she needs just to make ends meet. Every conservative argument against raising the minimum wage is just a smoke screen for the real culpret behind unemployment and our sluggesh economy, Wage Suppression!!! The following excerpt is taken directly from a GAO report called “HIGH-RISK SERIES An Update,” which highlights the difficulties in collecting revenue legally owed to our federal government. You will note from the steps recommended that significant collection efforts are to be focused on corporations and other business practices. The $450 billion in annual lost revenue does not take into account other shady tax loopholes used by the wealthy hide their income. It also isn’t clear if this total includes taxes lost in the underground cash and barter economies, which costs us billions in lost revenue. Unpaid taxes are an affront to a fair and balanced tax system. Lost revenue must be made up out of the pockets of law abiding citizens. Any changes to tax laws to make them fairer must include provisions to make collection more uniform. The Internal Revenue Service (IRS) recently estimated that the gross tax gap—the difference between taxes owed and taxes paid on time—was $450 billion for tax year 2006. For a portion of the gap, IRS is able to identify the responsible taxpayers. IRS estimated that it would collect $65 billion from these taxpayers through enforcement actions and late payments, leaving a net tax gap of $385 billion. The tax gap has been a persistent problem in spite of a myriad of congressional and IRS efforts to reduce it, as the rate at which taxpayers voluntarily comply with U.S. tax laws has changed little over the past three decades. Given that the tax gap has been persistent and dispersed across different types of taxes and taxpayers, coupled with tax code complexity and a globalizing economy, reducing the tax gap will require applying multiple strategies over a sustained period of time. • Since 2012, brokers have been required to report their clients’ basis for securities sales. • Since 2011, banks and other third parties have been required to report businesses’ credit card and similar receipts. • Starting with tax year 2010, IRS is requiring businesses to report on their tax returns uncertain tax positions—those for which a business reported a reserve amount in its financial statements to account for the possibility that IRS does not sustain the position upon examination or that the position may be litigated. • IRS is continuing its multiyear effort to replace the systems it uses to process individual tax returns and receive electronically filed tax returns. have experienced performance declines in recent years and IRS’s website could offer additional interactivity for taxpayers. Another initiative IRS undertook in 2010 was to begin implementing new requirements for paid tax return preparers, such as competency testing, with the goals of leveraging relationships with paid preparers and improving the accuracy of the tax returns they prepare. Given that they prepare approximately 60 percent of all tax returns filed, paid preparers have an enormous impact on IRS’s ability to administer tax laws effectively. In January 2013, the U.S. District Court for the District of Columbia enjoined IRS from enforcing the new requirements for paid preparers. IRS has filed a motion to suspend the injunction and intends to appeal the District Court’s decision. Further refining of direct revenue return-on-investment measures of its enforcement programs could improve how IRS allocates resources across its programs. Better use of such measures, subject to other considerations of tax administration, such as minimizing compliance costs and ensuring equitable treatment across different groups of taxpayers, could help maximize income tax collections. Resource allocation will become increasingly important as IRS is tasked with broader responsibilities, such as those in the Patient Protection and Affordable Care Act, in a time of tight budgets. Additionally, targeted legislative action may be needed to address some compliance issues. IRS has statutory authority — called math error authority—to correct certain errors, such as calculation mistakes or omitted or inconsistent entries, during tax return processing. Expanding such math error authority could help IRS correct additional errors before interest is owed by taxpayers and avoid burdensome audits. Additional types of information reporting could also help improve compliance. Taxpayers are much more likely to report their income accurately when the income is also reported to IRS by a third party. By matching information received from third-party payers with what payees report on their tax returns, IRS can detect income underreporting, including the failure to file a tax return. Currently, businesses must report to IRS payments for services they make to unincorporated persons or businesses, but payments to corporations generally do not have to be reported. Taxpayers who rent out real estate are required to report to IRS expense payments for certain services, such as payments for property repairs, only if their rental activity is considered a trade or business. Expanding information reporting in these areas could increase payee reporting compliance. In 2010, the Joint Committee on Taxation estimated revenue increases for a 10-year period from third-party reporting of (1) rental real estate service payments to be $2.5 billion and (2) service payments to corporations to be $3.4 billion. • develop return on investment measures to better allocate resources and maximize income tax collection. In that regard, IRS should implement GAO’s open recommendations, such as those on developing measures of direct revenue return on investment. To assist IRS in reducing the tax gap, Congress should consider expanding IRS’s math error authority to correct taxpayer calculation mistakes or omitted or inconsistent entries during tax return processing before issuing refunds. Congress should also consider requiring payers to report service payments to corporations and making rental real estate owners subject to the same payment reporting requirements regardless of whether they engaged in a trade or business under current law. In the event that IRS cannot implement its new requirements without additional statutory authority, Congress should consider whether tax compliance could be improved by regulating paid preparers. The ongoing debate about tax reform also provides opportunities to consider the effect of tax simplification on taxpayer compliance and the tax gap.